Product Blitz’s advertising campaign for Showalter Construction & Restoration has resulted in a 50x ROI on advertising and hundreds of thousands of dollars in the pipeline. Product Blitz was hired to do advertising & funnel creation work for Showalter Construction & Restoration, a company specializing in disaster relief services including water, wind, and fire damage. With the amount of damage done from the hurricanes in the southwest United States, the company wanted to take advantage of the opportunity to serve as many people as possible by amplifying their advertising to attract more leads. Most of their prior business had been through word of mouth, meaning they hadn’t had any experience doing paid advertising themselves. This limited the amount of people they could reach. Since they weren’t recognized in most of the places they traveled to during hurricane season, the lack of brand awareness left them going door-to-door as the only plausible marketing strategy. Until now. 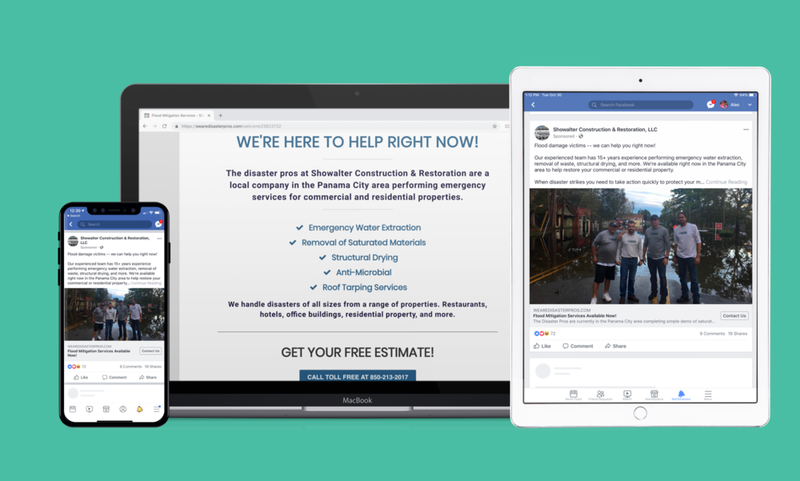 The marketing strategy that Product Blitz presented involves Facebook advertising combined with a landing page that outlines the services of Showalter Construction & Restoration. Since we’re advertising in disaster-relief areas, the services we’re marketing include emergency water extraction, removal of saturated materials, roof tarping, and more. If you have a water problem in any regard, they’re the company for you. And since so many people are affected by this in the area and need help ASAP, all we’ve needed to do is create ads that give a brief outline of our service and send them to a landing page with a larger overview. From there, the primary call to action is to call them. The process itself is rather simple, but it’s the art of the copywriting that has contributed to this company getting amazing results with us, which I’ll get into. On the mobile devices above (iPad & iPhone) is our best performing advertisement thus far. On the laptop is part of the landing page that visitors go to after they click on the ad for more information. As stated, when users get to the webpage, the main call to action is to get a free estimate by calling the number listed (as you can see at the bottom). However, if they don’t want to call, they can automatically fill out a form at the bottom and their information is automatically emailed to the company. However, the vast majority will call. The landing page is built on Clickfunnels and contact information is transferred to the client automatically through Zapier integration. The results have been incredibly strong with this advertising campaign. Showalter Construction & Restoration is getting at least 10-15 calls a day and its expected that the amount of revenue generated so far from the advertising is between $100,000-$150,000. That’s at least a 50x return on ad spend. And we’ve only been doing this for one month. They went from a company not spending any money on advertising to spending $6,000/month on Facebook with us, since it’s working so well. It definitely helps with the campaign that we’re advertising a service that is in incredible demand. In time of disaster, flood mitigation services are what people need to protect their homes from further disaster and protect their valuable assets. Even though the service is in high demand, as a company you still need to showcase yourself as trustworthy and being able to solve your customer’s problem to get calls. Customers are paying large sums of money for this service and they won’t call you unless they’re convinced you can help. There was a lot of effort that was put into the copywriting to ensure people called. We followed the same guidelines I talk about in my Storytelling Mastery article. The message is straight to the point, brings attention to the problem, and showcases Showalter Construction & Restoration as the guide to help the customer become victorious. The landing page checks all the boxes. Visit it here. As will all of the client work we do at Product Blitz, we’re always testing and trying new things to get the cost-per-click as low as we can. We’re always testing different audiences, ad copy, pictures, and more. And as you can see, it’s really paid off. Especially when you’re spending hundreds on ads a day like Showalter Construction & Restoration, you want to make sure those dollars are being best put to use.